Education: Alice must lift its game. Year 10 student who blitzed the recent Desert Knowledge Q&A with her incisive description of generational conflict – and harmony – in The Alice. In the spirit of Christmas, people are having parties. Many families, schools and workplaces are getting together to look back on the year that’s been, reward people for their efforts and perhaps, make amends for past mistakes. That is how a community moves forward and the same can be said for Alice Springs. Forums and meetings give us a chance to collectively examine the condition of this town. Events and celebrations bring people together from all across the community for one common, positive cause. Diversity in the citizens of Alice Springs is strength we need to build upon by having such gatherings all year round. From a student’s perspective, Alice Springs has a weakness in its education. While many schools, resources and staff are of great quality, we cannot ignore the fact that we, in the Northern Territory, have lower performance standards than the rest of Australia. If we want our Alice “up to speed” now and in the years to come, we need to secure a sound future, academically, for the next generation. Thank you to the many already striving to do so. All of Alice needs to join the continual effort to bring every one of its students to their full potential. So those are two ways in which Alice Springs could look to improve; more community events all year round and a solid effort towards educating the next generation. With that said, here’s to the future! Please click on FULL STORY then use the comment box to share your views. Do it now: Alice needs you! Australia is my home. It’s been since mid-80s. Being an Asian, I’ve established myself professionally in the Education Fields in Australia. I’ve always wanted to work with the Aboriginal Community. I’ve always wondered the reception that, we Asians, would receive. Having read the column by Max, this has enlightened my view of Alice Springs. I absolutely agree with Arthur Bell on his motivational approach. 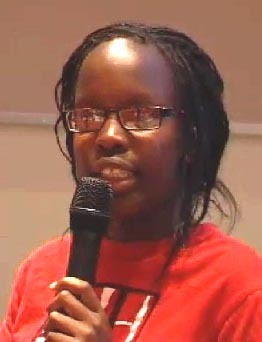 To the special girl, Kemy Ogendi, her speech is refreshingly touched. Yes, politicians and government personnel should act upon her speech of wisdom. Guide them. Lead them. I tell a lot of Aboriginal people including mostly the youth, Youse want to get off your arses and get going. Get involved. You know them Black people in America? Those African American People that Dominate World Sports? The Runners, the Boxers, all them Basketball and Baseball players? The West Indies cricket players? Bob Marley? All those Black Soul Singers? Those Black musicians? Your Heroes The Hip Hop Artists? You know about Barack Obama? The most powerful man in the world? And you see them Black Super Models? The highest paid in the World? You see all these thousands of Black African Refugees in Australia with thousands more to come? Well, they are all One Mob!! And in a few years time, not long, these people will Dominate in this Country. Just like they do in America!! And while you young (and old) fellas sit around playing Jacky Jacky, with your Surly, Chip on the Shoulder, Grudge Against Society Attitude, the African Aussie may will be the future, Black Face of Australia. And they feel No Obligation to Aboriginal People or the Aboriginal Cause. There will be a Black Prime Minister of Australia eventually. But you can bet your bottom dollar he (she) won’t be Aboriginal. With the tens of thousands and generations of highly motivated and qualified Indian people already here and involved in everything from bus and taxi drivers, railway workers to running their own businesses. And as registrars and consultants in charge of hospitals. And with their background it won’t be long before these people will be involved in the running of this Country. Nor do they have any sympathy for the so called, “Plight of the Aborigine”. The days of Dad and Dave and Jacky Jacky and the Boss are numbered. It won’t be to long before victim-hood will not be tolerated. The usual focussed thoughtfulness and long term thinking from Kemy. This girl should be on Council!